Upward facing dog- feel free to skip it and take a cobra instead, knees down, less wrist pressure. So the first two posts in this series covered the woes of full wrist extension in yoga, pilates, athletics, etc. Now that we've established why wrist intensive postures can be too much for musicians (full wrist extension coupled with large load coupled with frequency= ouch!) let's look at some solutions for going to group fitness classes, whether they be yoga, barre, HIIT, or something else. 1. If you regularly go to a vinyasa flow-style class (usually titles might be "vinyasa flow," "Hot flow," "Dynamic stretch," "Power flow,"), feel free to skip any of the vinyasa movements that are wrist intensive (i.e. plank to chaturanga to updog, any arm balances, etc.) Just because everyone else in the class is doing something DOESN'T mean you have to do it, or that you have to repeat a sequence as many times as other people. It doesn’t make you a weaker person to take agency about your own body and what works. Downward facing dog- ask a teacher for some help with your DFD if you feel like you have shoulder, wrist, and elbow pain. 2. Look for teachers who have experience with injuries, specialized conditions, anatomy, etc. The minimum required hours of training for yoga teaching is only 200 hours and many fitness trainers start doing weekend trainings, so look for folks who have additional teaching experience and have a teaching philosophy that shows adaptability. I have taken classes with teachers who are VERY defensive about modifying or allowing people to skip poses, and I've definitely been guilted into doing things I shouldn't because a teacher came over and said I should explore "my edge" or push myself. Give yourself permission to do what's right for you and don't attend classes where you feel unwelcome because of your restrictions or modifications. Regardless of your age, size, or ability, teachers don’t have a right to make you feel less than others if you don’t do everything they cue in a class. 3. Ask a teacher, trainer, PT, or coach (that you trust) to look at your setup, especially in Downward facing dog, planks, push ups, and other weight bearing positions. They can either help modify or alter the pose in a way that will challenge you but prevent discomfort or strain. They can also help you create a progression that will build strength and progressively load your wrists over time. 4. Look for styles of yoga that don't put as much emphasis in sequencing on wrist intensive poses. Ashtanga, vinyasa, and power classes tend to be more dynamic, weight-bearing, and wrist intensive. Iyengar, "slow flow," restorative, yin, and basics classes are usually slower and less weight bearing before you speed things up. (Bikram also puts minimal stress on the wrists, but I get headaches in 100 degree rooms. I leave that one with you.) If you’re looking at a gym, HIIT, or other class, some trainers throw in push ups for fun every few minutes, others look at quality of movement and more compound complex movements. Investigate, do some research, and make your choice. The wrist wedge decreases the degree of wrist extension needed. 5. Prop it up! Yoga props are sometimes a mysterious thing for some students, but they can really help to find new ways of practicing. a. Foam or cork wedges can help decrease the wrist extension. This is a block that allows gripping instead of placing the hand flat down on the floor or block. b. Grippy blocks can change the wrist position, but sometimes the gripping can make existing wrist problems worse. c. Wrist guards- I had a pair of Wags (wrist assured gloves) for many years while I was rehabilitating from my tendonitis (ca. 2009), and they helped amazingly. There are many different sorts of wrist guards out there, but these have a built in wedge of silicone to decrease the angle of wrist extension, which helps a lot. They're also marketed to yoga, pilates, and TRX, so they're not just a yoga thing. Dolphin (with arms in supinate). A terrific way to strengthen the shoulder without taxing the wrists. 6. Consider trading your downward facing dogs, planks, and side planks for dolphin variations, which is on the forearms. Not only is forearm plank very challenging for the shoulders and core, it's not wrist intensive and will prepare your body for other weight bearing poses. 7. If you don't have any extra props available to you, just fold up the front part of your mat and boom!, you have a built in yoga wedge. This is a quick fix for any mid-class wrist discomfort (besides taking a break). 8. If a teacher tries to make you feel badly about your limitations, don't take it personally and do what you think is best. Some teachers now have a "more is more" attitude when it comes to vinyasas and intense poses, and they may have no idea about your needs. It's also not a race to see who can do the most chaturangas in a class. 9. Lastly, make sure you have solid hand alignment. Fingers are spread wide, with weight spread throughout the palm and knuckles. There is no one perfect shape for weight bearing hands, but there are definitely less advantageous shapes. When the weight sinks into the base of the palm, and is not distributed throughout the hand, it's often uncomfortable. Some people prefer middle finger pointed forward, others like the hand turned out slightly...different "alignments" for different people. Above all, remember that a lifetime of static positions (holding your instrument) means that your wrists, forearms, and shoulders need to slowly adjust to bearing weight. Whether you're a yoga person, pilates person, or strength and conditioning person, gradual change and adaptation is key. On Monday, I posted a bit about why your wrists might not easily explore full ranges of extension, especially if you spend your whole musical and technological life in flexion. I additionally had two students in my yoga classes yesterday that complained of wrist pain, and it reminded me that we teachers can do better in teaching progression and strength. First though, what are some of the postures in yoga (and pilates and other movement disciplines) that might create full wrist extension? This is sometimes seen as "table top," or the beginning of cat cow, or quadruped. It may come at the beginning of class, but it can be hard on the wrists if the range isn't there. Whether at the top of a pushup or the beginning of a spine warm-up, this set up requires full wrist extension. One way of modifying it is to make a fist and use the knuckles as the contact point with the ground. Another option is to roll up the edge of your mat and decrease the angle of wrist extension needed. Planks on top of physio balls are equally demanding, as well as side planks, so keep in mind that pilates and traditional gym classes may also be taxing. I mentioned this last time, but DFD requires wrist extension, but not to 90 degrees. It's usually less taxing than the plank to pushup situation, but as with other weight bearing poses, it’s about progression, building strength over time, and not suddenly doing 50 Downward dogs out of the blue. This posture, upward facing dog, requires the body weight to be lifted on the wrists, whereas cobra keeps contact between hips and the mat. That's a little tough on the wrists sometimes. 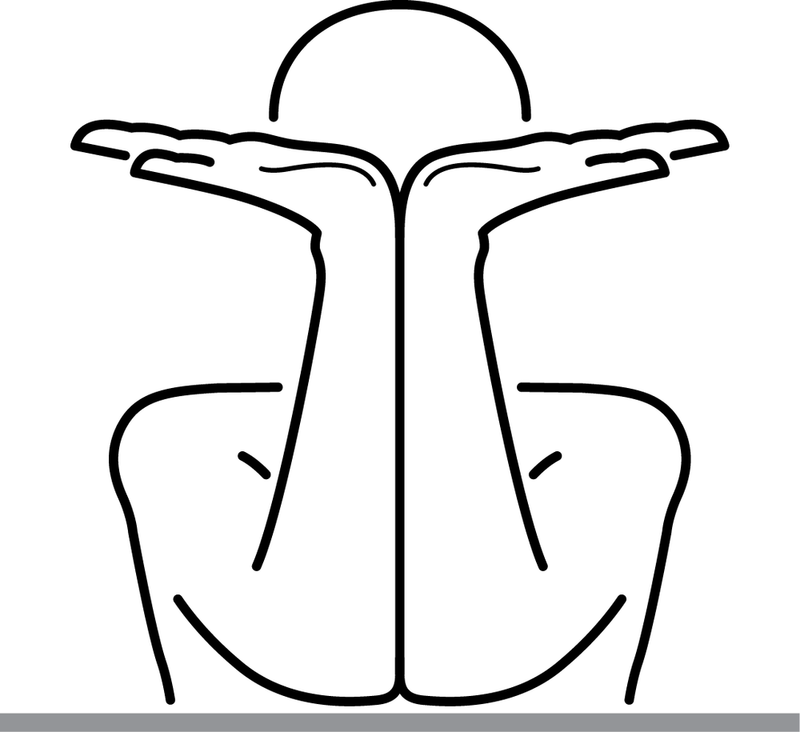 This pose is commonly called crow or crane, depending on the variation. For obvious reasons, it can be a bit tough on the paws. Whether it's crow, side crow, twisted scissors, handstand, or galavasana, your entire body weight is balanced over your hands. If you have weak wrists, limited range of motion, or have no idea if you should be doing arm balances, you probably shouldn't. For years, this was my wrist nemesis. It requires shoulder mobility and wrist mobility, and I always wanted to do it because everyone else could. Even now, I can't hold it for a long time, and I have to be really mindful about warming up my body before I attempt it. Stick with bridge if you're sensitive, or put the hands on blocks against the wall to decrease the range (or grab a hold of the teacher's ankles). Now that we've looked at some of the wrist extension culprits, we'll address some ways to modify postures to make them more wrist friendly, and how to work on building your range and strength over time. 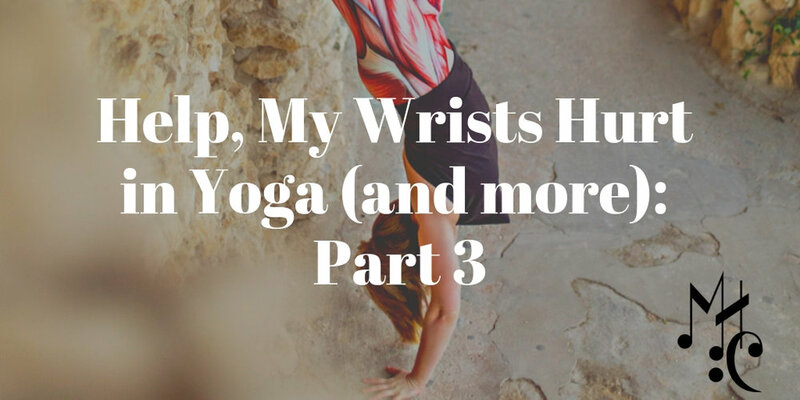 One of the questions I'm most frequently asked is why yoga makes our wrists hurt so much in yoga, pilates, planks, and other movements. First thing, let's look at the small bones of the wrist and what's going on in there. Can you tell I'm excited about my new model skeleton? We flex the wrist to type and text, we extend the wrist to do plank and down dog. It also means that we may not have the same range in the opposite direction that some people do. There are many different styles of yoga, but the many flow styles these days emphasize vinyasas or the sequence of plank, chaturanga, to upward facing dog. Even if those terms don't mean anything to you, think plank to pushup, repeated over and over, which occurs in many fitness formats. So why does this sequence hurt so many folks? Well, most musicians (and normal people) keep their wrists in partial flexion, whether they are desk bound, using their phone, keyboardists, string players, woodwind players, teachers, etc. That partial flexion adds up over the years, especially if we never use the opposite range of motion- wrist extension. The tissues of the palm, hand, and forearm, stay partially contracted, and then limit our range of extension. One day, you decide to try yoga, which demands a lot of wrist extension plus you decide to LOAD your whole body weight on top of it, and then you wonder why things hurt. Staying in one position for a long time (like 15-20 years, many hours a day) keeps the muscles and connective tissue in that position- making it difficult to adapt to the opposite shape of extension. 1) build the range of motion in extension, and 2) progressively load those tissues to build up strength. If we never use our wrists in extension, we need to gently progress with range of motion and weight, rather than putting 130-230 pounds on our hands out of the blue. That means you can’t go from zero to full plank/push up hour without some gradual change to optimize adaptation. My wrists are sometimes tight- you can see that it's hard for my thumb to fully rest on the floor without a small bend..
Let's get more specific- planks require full wrist extension (meaning that the distance between the back of the hand and forearm is 90 degrees) whereas down dog is more of a 60 degree angle, depending on many factors. Notice that the angle between the forearm and wrist is acute, whereas the other is a right angle? Imagefrom the Melt Method, which has a terrific hand and foot massage kit! So then, imagine repeating full extension over and over again when you don't actually have that full range, or you only have it on one side. In addition, it’s been days, weeks or months since you’ve done yoga, so your body hasn’t been loaded this way. First, let's test the range you have in your wrists right now, shall we? Bring your forearms together in front of your chest, then allow your wrists to extend comfortably. Don't force it. Do your wrists naturally open to a 180 degree angle? Or is one side more acute (hello left hand for me!)? That explains why full extension might aggravate things! I'll talk a bit more about poses that are wrist intensive next time, and how to help your wrists out, and possibly gain more range in the long run. tags / wrists, yoga, pain, extension, flexion, adaptive shortening, help! As we move into 2019, I close in on almost 5 years (this January) of running this blog, which is a bit of a shock to me. It started as a digital notebook of things that I was learning, and has since been expanding to be a unique hybrid of teaching observations, anatomy musings, musical thoughts, and more. This year alone, there’s been over 45,000 visitors to the site, which is truly astonishing. More musicians than ever are seeing the value of movement and self care as means of self preservation, as well as tools to actually improve and expand your musical toolbox. Our challenge is the last week of November- a time when musicians are busy getting ready for holiday gigs, the end of the semester, and family time…also a time when self care can easily go on the back burner, despite the physical rigor of needing to play a lot. To round out the year, I’m excited to finally be filming and finishing musician warm up videos, as well as launching a mind body warm up challenge with fellow musician movers Travis Baird, Karen Bulmer, Vanessa Mulvey, and Cicely Nelson. Each day, we’ll share a video of a mind-body warm up, and you can follow along, share your own versions of the exercises, or just comment. Amongst our participants, I will be giving away two copies of my warm up videos, as well as a free private session with me, either on music, movement, yoga, pilates…whatever you want! To get our daily emails and be entered in to win, go to www.musicianshealthcollective.com/subscribe I am so excited to be collaborating with some amazing colleagues on this project and hope you will join us. This is not always the case! In Elizabeth Andrews' book, "Muscle Management for Musicians," she outlines three different categories, which I've found helpful to look at and evaluate, both for students, teachers, and professionals. Yes, this is real. It's a contrabass flute. 1. Musician Versus Instrument: This can mean the size and shape of your particular instrument (one viola vs. another) or having to play a lot of contrabassoon/bass flute/subcontrabass sax/etc. in relation to your normal workload. This can also be as simple as pointing out that not everyone can reach the keys on a flute (without contorting one's hand) or that a full size string bass is not for most people. There are an infinite number of ways to alter one's setup to potentially help support the body, and those changes definitely fall into this category. 2. Musician Versus Environment: This is a category orchestral players are certainly aware of- chairs, stand height, conditions of the room/space/concert hall, temperature, etc. This can also include clothing restrictions (violinists in tuxedos, high heels for performance, or simple elevating one foot to play bass or guitar) or even carrying one's instrument (s) upstairs, around the city, etc. Wielding a contrabassoon is not the easiest! For string players, this could also include the way one has to rotate one's chair or torso to share a stand, or the cramped sitting positions of the orchestral pit. This category also includes the acoustical aspects of the space- perhaps creating conditions that are excessively loud, resonant, or putting players too close together. 3. Musician Versus Self: In my mind this includes the other things we do that stress our arms, body, voice, spine, etc., which includes computer use, cell phone use, driving, standing (! ), sleeping, etc. I love Elizabeth's categories, and although I've altered the descriptions a bit to be more relevant, I think they're great points. I would however, add a fourth category. 4. Musician Versus Music: Sometimes, even against your best intentions, the repertoire that you're studying, playing in ensemble, or preparing for an audition is too much for your body. I've previously talked about how Paganini may have been hypermobile- for some folks, the extensions and left hand demands of the caprices are too intense and not practical. This is true for a lot of contemporary repertoire in general- as our levels of mastery and virtuosity have skyrocketed, so have the demands of our pieces, often bringing near impossible pieces into the forefront of music. (For example, some violists find the extensions in the Schnittke concerto to be too extreme.) That doesn't mean that those pieces don't deserve study, they just may not be the right piece for you, or for you right now, or for you with your current instrument. Another example might be an orchestra or opera company planning to do a Ring Cycle performance, which is a huge undertaking for any instrumentalist. The rehearsal schedule alone might be very taxing, let alone the music itself, especially if you have never played them before and are learning the repertoire for the first time. Even if you're doing your best to take care of yourself, the repertoire, concert schedule, rehearsal schedule, or audition list might be too much for you, either now or in general. I've always been afraid of taking an opera orchestral job because of the challenges (physically and mentally) of playing cycles of Wagner operas. Loud volumes, orchestral pits, and an infinite amount of string notes scare me! If you've been injured, reflect on what it was that may have caused or exacerbated the injury- which categories were applicable? Having an awareness of these categories can certainly prevent future injuries, especially if you know what previously caused an injury.